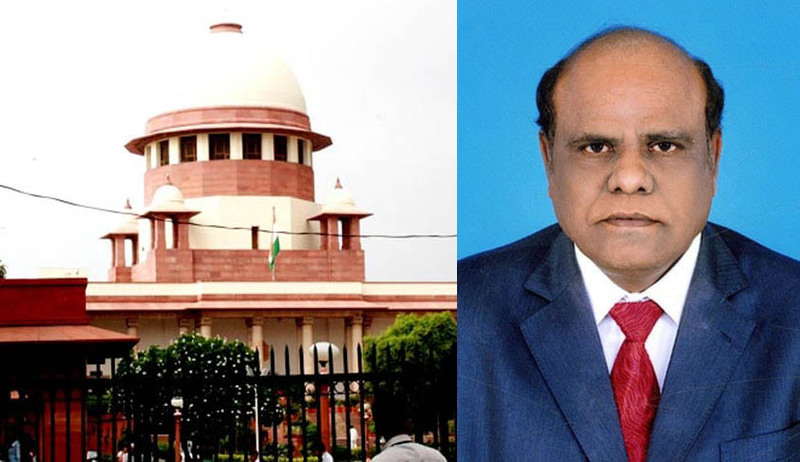 In an unprecedented act, the Supreme Court today sentenced Calcutta High Court judge C S Karnan to 6 months in jail for contempt. "On merits, we are of the considered view, that Sri Justice C.S. Karnan, has committed contempt of the judiciary. His actions constitute contempt of this Court, and of the judiciary of the gravest nature. Having found him guilty of committing contempt, we convict him accordingly. We are satisfied to punish him by sentencing him to imprisonment for six months. As a consequence, the contemnor shall not perform any administrative or judicial functions", the 7 judge bench headed by Chief Justice J S Khehar said. All parties- ASG Maninder Sing, Advocate K K Venugopal assisting the court and SCBA President R S Suri agreed that Karnans acts were unpardonable and he deserved strictest punishment. But Venugopal suggested the court to wait for Justice Karnan to retire to proceed against him. To this the CJI thundered: " in contempt we do not distinguish..there is no colour...sitting or non-sitting..if he thought we will not punish him as he is sitting, he is wrong"
Justice P C Ghose also intervened to say the Court only seeing him as a "citizen of India" and the rule is same for all citizens. The Court has also restrained the print and electronic media from publishing Justice Karnan's statements any more. "Since the incident of contempt includes public statements and publication of orders made by the contemnor, which were highlighted by the electronic and print media, we are of the view, that no further statements made by him should be published hereafter", states the order. The hearing comes a day after Justice Karnan, who is facing contempt proceedings in Supreme Court for making scandalous corruption allegations against its sitting and retired judges passed another bizarre order “convicting Chief Justice Of India Justice Khehar and other Six Supreme Court Judges for various offences under SC/ST (Prevention of Atrocities) Act and sentenced to 5 years imprisonment. In his “order” Justice Karnan said that on considering the history of the case and on the basis of orders passed by Accused, all the orders clears the intention of all accused in order to harass the Dalit Judge. The order for Justice Karnan’s medical check up was passed last Monday by the seven Judge Constitution Bench. The bench was particularly miffed over two recent “judicial orders” passed by Justice Karnan (when he was restrained from issuing judicial or administrative orders) summoning the Judges of seven Judge Bench, and directing the Air Control Authority to not allow the seven SC Judges to travel abroad. The Bench had then found that he was not in a position to defend himself now, and had directed the DGP, West Bengal to constitute a team of police personnel to get the examination conducted. But Justice Karnan turned away the medical team saying he was perfectly normal. Instead he handed over them a letter. In a letter addressed to the Medical Board of the Calcutta Parlov Hospital, Calcutta HC Judge Justice Karnan has demanded that the Judges constituting the seven Judge Constitution Bench do the “right thing by resigning their posts”, as he felt that it is “too obvious” that they’re working only for personal gain. The letter further stated that the Supreme Court order directing his medical examination amounted to “insult and harassment to a Dalit Judge”, and revealed that the seven Judges were “misusing” their judicial powers.